Many people are worried that the introduction of computers into medicine will further depersonalize clinical care . Their concern is that technology will disrupt the doctor-patient relationship because doctors will start focusing more on the computer screen , rather than on their patients. It's true that doctors find technology very seductive and many enjoy interpreting medical reports and images and scans because they feel this is part of their scientific core competence. However, taking a digital technology versus humanistic clinical care is not a very helpful viewpoint . By adopting such a polarizing approach , we're treating this as a confrontation , and are wasting a great opportunity to improve medical care. Both are complementary , and rather than treat technology as a distraction, we need to learn that it can actually help doctors practice more humane medicine . By providing them with additional tools to make the right diagnosis, it gives them more time to talk to their patients, thus promoting doctor-patient interaction ! When a doctor sees a patient , his first priority is medical – he needs to make the right diagnosis and craft the correct treatment plan. It's only when he is sure he has done a good job as a clinical scientist can he then think about managing the patient’s psyche and emotions. This means that the doctor has two tasks which require complementary skill sets. The first task is one which requires logical scientific analysis , where he collects the right data and works through a differential diagnoses . It is only after he has made the right diagnosis that he can then move on to his second task , which consists of caring for the patient ; holding his hand ; and helping to guide him . Some doctors who have an excellent bedside manner are often poor diagnosticians; and this can make the patient's life very difficult , because the patient really does require both compassion and competent clinical care . Computers can help doctors to make the right diagnosis more quickly, because they can act as peripheral digital brains . They help the doctor to ensure that he has covered all the diagnostic possibilities , so he is no longer worried that he may have missed something important . This is one of the major fears which every doctor has ; and until he has confidence in his clinical diagnosis, he cannot move on to dealing with the patient as a human being . The computer can help to expedite the process of making the right diagnosis so that the doctor has more time to spend talking with the patient . It can also give the doctor a lot more security in his clinical competence, so that he can then work on polishing his interpersonal communication skills. Compassion is something which a doctor can provide only after he has ensured that he's provided basic correct clinical care. If a computer can allow him to do so more efficiently, he then has more time and energy to be able to enhance his empathy. HELP is organizing a conference on “Putting Patients First Through Health Literacy“. This will be on Sunday, 2nd December’12 at Nehru Center at 10.30a.m. to 1.p.m. The website is www.patientpower.in/2012 The conference will be followed by a health literacy workshop in the afternoon. Helen Osborne, President, Health Literacy, a world renowned Consultant from US , will be delivering the keynote and conducting the workshop. 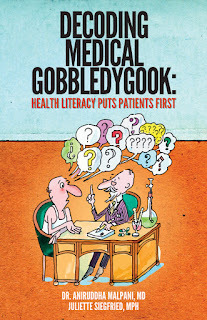 Her website is at www.healthliteracy.com We will be releasing our book, Decoding Medical Gobbledygook – Health Literacy Puts Patients First, at the conference ! I am 37 years old and my wife is 29 years old. We had been married for 3+ yrs, and had been trying to get pregnant ever since but unfortunately suffered a miscarriage first; and the second time it was an ectopic pregnancy where my wife lost her left fallopian tube. By losing one tube, chances of getting pregnant goes down by 50%. We live in Bangalore, and consulted many infertility specialists in Bangalore. We were extremely stressed & dejected and started avoiding our friends and relatives whose only question was when are we going to give the good news. We were spending most of our income on our treatments and obviously this took financial toll on us too. Apart from that, doctors whom we met all these years were too commercial and somehow I thought infertility has become a money spinning business for IVF clinics without any human touch. Though me and my wife was so fed up with all these useless treatments that we refused to take any further treatment and almost decided to live life as it comes. We both were not interested to go for IUI since we heard that our friends underwent IUI all of which had failed. One last time we went for a second opinion with one of the specialists in Bangalore. Once he saw all our past reports he directly suggested us to go for IVF. But he insisted us to go for IVF only with Dr. Malpani in Mumbai. This was little confusing and we needed to think about it – why was he advising us to go all the way to Mumbai ? Didn’t have Bangalore have good IVF clinics as well ? The same day in the evening we went through Dr.Malpani’s website and were impressed by their work and the success stories. The next day we scanned all our reports to the doctor through mail. To our surprise the doctor replied to us within 4 to 5 hrs with the required information with cost of IVF. We decided to take some time off before starting the next cycle. Finally we decided to take up the treatment . We kept in touch with Dr Malpani through Emails and he was always prompt in responding to mails. We never felt we are 1200 Kms away from Dr Malpani as he was always reachable by email. We were quite impressed with the professionalism and prompt response. My wife started taking injections in Bangalore itself and landed in Mumbai on 10'th day of her cycle in August 2012. We stayed near the clinic so commute was not a problem. But there was some bad news in store for us. Dr Malpani did the scan and told that there were not many follicles on 10'th day and we may have to cancel the cycle. We were heart broken and thought that all our efforts had gone to waste. But then the doctor suggested doubling the injection dose ; and recommended that we see how the ovaries respond in next 3-4 days , after which we would take a call. We agreed and decided to continue for 3-4 days more. We hoped that the follicles would grow and increase in next 3-4 days. After 4 days of increased medication, miracle happened and Dr Anjali Malpani told us that she could see many more follicles ; and that they needed a few more days to mature before retrieval. We were scheduled for retrieval on 5th September2012 and Dr Malpani told me that they collected as many as 18 eggs of which 10 eggs were mature. Embryo transfer was scheduled for 7th September 2012. It was little disappointing when he told that there was only 3 good quality embryos out of 10 matured eggs. Dr Mapani again comforted us and showed us the embryos in the lab. It was great to be able to see the embryos which were ultimately going to become babies. This shows that Dr Malpani really believes in empowering the patient by providing as much information as possible. No other doctor I visited earlier cared to tell us what they were doing. Many a times we would ask him stupid questions and he would address them with patience. I found this a very rare quality among today's doctors. He transferred 3 good quality embryos and after 3 days of rest, we came back to Bangalore. After 15 days, we did our first bHCG test and oh my god!, IT WAS POSITIVE. We first could not believe it and we were waiting for this moment from last 3 years. I called Dr Malpani immediately and gave him the good news. He was also very happy to hear this. Then he suggested repeating the tests after 3 days. When we repeated the test after 3 days, bHCG doubled which indicated that this is a viable pregnancy. Now my wife is 12 weeks pregnant and these are the most precious moments in our life. I treasure my wife's pregnancy and I am enjoying it. All our doubts and questions are still cleared by Dr. Malpani through mail and we are also comforted by his response. Our sincere thanks to Dr Malpani and Dr. Anjali Malpani for their comfort and positive attitude. We take this opportunity to thank the staff at the clinic for their friendly approach and the homely ambience. sick , you don't just want treatment - you need someone who will hold your hand ; provide you with a shoulder to cry on ; and treat you with tender loving care and compassion. The danger is that too much data and digital analysis will end up depersonalizing medicine, rather than personalizing it ! 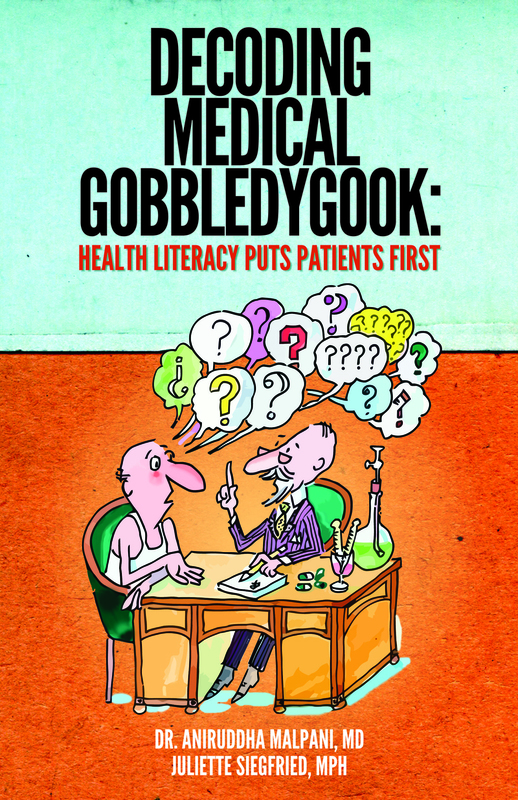 How can we use marketing strategies to promote Health Literacy? This is a guest post by Hema Vishwanathan. Advertisers are masters of the art of persuading people to buy stuff! How can we use their skills to help promote health literacy? What lessons can we learn from them? I have extensive experience in using marketing to promote public health and would like to share two examples. It is my hope that we can adapt these to promote health literacy as well. • Define and describe the target audience: The target audience needs to be defined clearly. Who are we addressing? Before communication can begin, we need to know who this person is (demography), where he or she can be found (geography) and how he or she can be reached (media). • Understand the target audience: All good communication begins with understanding the customer and looking into her needs, wants and expectations. Needs are both overt and subliminal. The world of advertising has mastered the art of addressing subliminal needs in subtle yet powerful ways. There is greater impact achieved through touching the more subtle needs than the more overt needs. • Decide on the message and keep it simple: The third requirement is to get clarity on the message that we want to deliver. What do we want to say? What does the consumer (patient/ audience) want to know? Somewhere in the wide gap between what we want to tell and what they want to know, we need to find common ground. The point where these intersect offers a starting point for communication because the conversation can then begin with what the consumer wants and then lead to what you want – it is only when communication starts from a point of mutual interest that it has any hope of going forward in a productive way. • Say it again and again: The fourth reality is that communication needs to be repeated – again and again. Messages do not go out easily, even when talking one-on-one. There are gaps between the intended message and message received by the listener; there are gaps in attention and perception; there are distractions – and this is when you are sitting and talking to one person. When mass communication beams out messages to millions of people in an impersonal situation, the gaps are huge. In addition to all of the above – attention, intention, perception and distraction – there is the huge problem of noise. Hundreds of messages are trying to reach out to the same person – and he really does not want to listen to any of them. They are trying to grab his attention at a time when his interest lies elsewhere – whether on a TV channel, on the radio, through the print media or through the outdoor media. • Use the magic of modern communication: The fifth reality is that all of our earlier knowledge about marketing and communication has been churned beyond recognition by technology. Communication today is a different ballgame. It is continuous, instant, hydra-headed and with multiple arms, and so ambidextrous that it often defies comprehension and measurement. Today’s flavour of the month can become a billion dollar blockbuster – or end up in the garbage – and it’s impossible to predict this with any accuracy. The good news is there are now myriad opportunities to reach out to the consumer – through the Internet, the mobile phone, through search engines, messaging, and free apps. The opportunities to connect have multiplied and become omnipresent. • Get the policy makers on your side: Finally there is the one item that is all-important in the field of public health and that is political will. It is the magic wand that can make all the difference to public health. In fact, without political will and the policy decisions that follow from political will, all public health efforts will amount to zilch. With the government on the right side of public health requirements, anything is possible. In fact I would say that for public health, policy is the first and most important requirement – everything else can follow later. Of course, getting the right policy decisions is in large part a function of luck. Everything depends on having the right bureaucrat in the right place at the right time. If you are lucky to get someone who is willing to listen and to understand and is focused on improving public health, half the battle is won. Without this kind of a person in the chair, all well-meaning efforts are likely to go down the drain very quickly. Our first case study begins in the mid-1980s when WHO was concerned about the number of childhood deaths caused by diarrheal disease in India. WHO had made the assumption that these deaths must be happening because mothers were ignorant and had probably stopped giving the child food and fluids when he/she got diarrhoea, in an attempt to stop the diarrhoea. A communication strategy was being planned on the basis of these assumptions when some senior officers at UNICEF decided that the assumptions needed to be checked out. I was fortunate to be in charge of the nationwide research study that sought to understand what mothers actually did when the child developed diarrhoea. In the first phase of the study, we went to mothers from over 150 villages spread across the country and asked them: “What would your grandmother have told you to do when a child had diarrhoea?” That simple question revealed a long list of fluids and semi-fluid options that completely stunned the decision-makers who had assumed that mothers would be ignorant. It revealed that the traditional knowledge on the subject of rehydration was excellent. We found that mothers knew about rice water, dal water, buttermilk, barley water, breast milk, coconut water, khichdi, sago porridge… the list was long and rich. The tradition was and had always been to give fluids and semi-solid foods to a child during diarrhoea. But why, then, were children dying of diarrhoea and dehydration? If the knowledge was so good, what was the problem? The second phase of the study looked into what mothers had actually done in practice. So we went to nearly 10,000 mothers across the country whose child had had diarrhoea in the last 15 days and asked them: “What did you give to the child when he had diarrhoea?” The answers were again stunning – mothers had given nothing other than tea, milk, water. The rich tradition of rehydration, about which there was still some residual knowledge, had in fact been lost in practice. Lack of time, lack of conviction and the desire to be modern had led the women to shun “grandmother’s methods”; yet there was no equally effective alternative available known to the mother in today’s methods. The study also found that mothers were unimpressed by the idea of giving a homemade sugar-salt solution to the child. This lacked the impressive scientific aura of expensive medicines, or even better, of injections. If she must do something at home, we realised, she would prefer to open a packet of ORS. In addition, we tested (and found) that it was difficult to get her to add the right quantity of salt to a litre of water. Armed with all this data and with the help of the Health Secretary, the findings were presented to the Parliamentary Consultative Committee on diarrheal disease. These were accepted and the revised National Diarrhoea Management Plan was drafted to place major emphasis on well known, localised, home available fluids and soft food as well as on breast milk for infants; in addition, the child was to be given ORS. ORS had recently, at that time, been deregulated and made available over the counter (OTC). The revised NDMP planned a major social marketing effort to make ORS widely known and available. That formed the starting point of a major communication campaign carried out by the Ministry of Health during the period from 1988 to 1998. Television channels beamed out messages on Doordarshan as well as on other popular channels reminding mothers that some of the best remedies for diarrhoea were to be found right there in the kitchen, remedies that had been known to Indian mothers for many centuries. The advertisements reminded mothers of a large range of home-based fluids that would be best for the child when the child developed diarrhoea. In addition, she could also approach her nearest health worker for a packet of ORS and keep the child continuously rehydrated. The campaign worked very well and there was a clear decrease in diarrhoeal deaths after this campaign. The second case study is about communication to promote Infant Immunisation. When the Government of India decided to adopt the Universal Immunisation Programme (UIP) into the public health programme in 1987-88, it set up a Technology Mission to ensure the successful roll-out and adoption of this program. It was planned as a phased roll-out, with the first pilot being carried out in 12 districts across the country. Once again, I was fortunate to be in charge of the research to assess problems related to programme dropouts. The UIP schedule was initially started as a five-point schedule – Anti-tetanus injections during pregnancy, BCG at birth, DPT and Polio in three rounds before the age of six months and then measles towards the 9th month of the child’s life. The problem in the initial pilot phase was that mothers tended to not finish the course. Our study found several problems that were operational and attitudinal in nature. To the credit of the Technology mission, the operational problems were not just understood immediately but they were accepted and acted upon, then and there, as the results were being presented. Sam Pitroda and Jairam Ramesh took decisions on the spot and communicated the desired action to the health ministry officials sitting in the meeting. It was a joy to watch the process, because of the power vested with the technology missions and the decisiveness with which action was taken. However, we realised that an important part of the job would be to convince parents that it was indeed important to get the child immunised. In addition, communication was needed to persuade grandparents, who resisted these new-fangled requirements and resented the fact that the young daughter-in-law had to leave her housework and go to the health centre on so many occasions. The idea of disease prevention did not cut ice. Not only was there resistance to the idea of giving an injection to the child when he/ she was not ill, it seemed ridiculous to the mother (and grandparents) that the child actually seemed more ill on the day after the injections. The idea seemed backwards – to take a healthy child and get him injected and then have him feel unwell the next day! Those who were working on communication knew that the results would only be visible 20-30 years down the line - and it gladdens my heart when I go into villages today and the villagers tell me, spontaneously, that children do not fall ill as often as they used to. But at that time, it was difficult to persuade mothers to accept the idea. Communication was needed to persuade all the stakeholders, but most importantly parents and grandparents, that a newborn should be immunised. As part of a follow up study that was being carried out on the subject of immunisation, we added a question “Which do you fear more in your child – disability or death?” Over half of all respondents said that they feared disability more than death. This was even truer in the case of a girl child. If a child became disabled, the worry and difficulties lasted for the lifetime of the parents and beyond; the worry of what would happen to the child after the parents were gone would haunt a parent at all times. In addition, it could spell financial disaster for a poor family. While a child’s death was also deeply feared, the idea of a child becoming permanently disabled was much more traumatic because it was felt to be a fate worse than death. This insight provided the communication handle that we needed. It was decided that communication would play on this fear of disability and use polio as the leading message. Posters and advertisements used pictures of a young boy severely disabled by polio. The simple message was – prevent this from happening to your child by getting your child immunised today. The communication worked. This message (along with actions taken to iron out logistical problems in vaccine delivery) saw the acceptance of UIP rise systematically over the years. Today we have over 75% of infants being covered by BCG and DPT 1. It has taken a lot of effort beyond the communication campaign started 20 years ago, but it is still a joy to learn that India is gearing up to be declared polio-free by 2014. It takes time, energy and imagination to craft the right message and the path to success is likely to be littered with failures. The good news is that there are enough success stories we can learn from that we can tackle the problem of health literacy effectively. We are accustomed to having blood tests done when we go to our doctor because they provide important diagnostic clues about disease. Lab tests offer the doctor a window into your body and when the pathology laboratory translates your blood into a stream of numbers, units and acronyms, your doctor can analyse this data to make the right diagnosis. However, most lab reports don’t seem designed to provide you with any intelligible information whatsoever. The typical blood test report is an exercise in obfuscation, a document that needs to be interpreted by a physician. However, lab reports don’t have to be unintelligible. With some thought, the results can be displayed so that they are as informative to patients as they are to physicians. Patients need to be able to understand their blood test “numbers”, so they can translate this knowledge into action, and become participants in their own health. Let’s look at blood sugar levels for example. Diabetics need to monitor blood sugar levels continuously, and every diabetic knows that better control means better health and lower medication costs. The blood sugar report should help the patient and his doctor manage the disease. However, rather than just providing a single blood sugar level number, it would be much more helpful to the patient if serial values were provided in the form of a graph, so the patient could clearly see how well he was controlling his sugar levels. The good news is that even though labs still don’t do this, clever websites such as SugarStats (@ http://www.sugarstats.com) allow patients to track their blood sugar levels free of cost. This is a valuable online diabetes management tool – and similar sites need to be developed to manage other chronic diseases as well.